Parents may want to check out the NEW College Board PARENT section of their website, especially their *Parent Webinar* series. You'll see that there are several directly related to the College Board Advanced Placement (AP) program, giving you further background on the goals of AP overall. Plus you'll find great ideas on navigating the whole college admissions process also. Well worth a look! ALSO-- check out this excellent new College Board AP page especially for *homeschool students*! This includes everything you need to know in a nice 2-page PDF you can print out or use online! We are pleased to be able to offer once again a full listing of AP courses-- hope you'll be able to find a course here that matches your student's interests and abilities! These courses help students be well prepared for the College Board AP Exams, given in mid-May each year (see this link for the 2018-2019 AP exam schedule). FLASH!!! 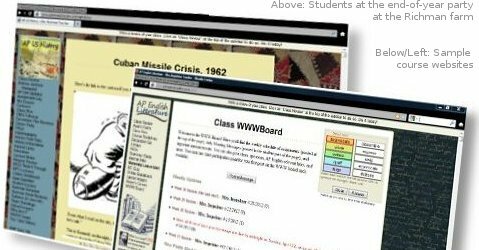 We really enjoyed this blog article, reviewing AP courses available online, from the PrepScholar blog site-- this is NOT a site just for homeschoolers. Guess which online program gets TOP BILLING??? Yep, Pennsylvania Homeschoolers AP Online!!! Jessica Newman will be leading the newly redesigned AP World History: Modern course. Jessica is a very experienced AP teacher, and has led both AP World History and AP European History in the public high school where she has been teaching for a number of years, and has even served as an AP European History exam reader (in this experience, she met our new AP European History teacher-- see below!). We're very excited to have Mrs. Newman joining us! As Mrs. Newman notes in her course description, this AP exam has been *updated* for the coming school year, covering now the modern era from 1200 CE through the current day-- ancient history will no longer be a focus on the exam (a future AP World History: Ancient course may be added to the College Board offerings in a few years). Mrs. Newman will update her course description as more details are given by the College Board on the re-designed AP World History: Modern course. Meredith Noah will be leading AP European History. Meredith is a very experienced AP European History teacher and is also a long-term AP Euro exam reader-- this rich experiential background (and her very active travel to Europe!) will really help her bring enthusiasm and sure knowledge to her online teaching. We are delighted to have Ms. Noah join our staff of teachers-- and I know that Ms. Noah's very positive experiences working as an online tutor for one of our Pennsylvania Homeschoolers AP Online students a few years ago helped her want to look into working now with homeschoolers in an online course setting. Mark Kernion will be leading a second section of AP Chemistry, a course that has become increasingly popular among our students. If that last name looks familiar, Mark Kernion is indeed the identical twin brother to one of our AP Physics teachers-- Jack Kernion! This is truly a family that loves the sciences-- and Mark brings a long and dedicated and varied career in this field to his teaching. He is a very experienced soon-to-retire AP Chemistry teacher from a strong suburban high school in the Pittsburgh area, and I know he's looking forward to having a very positive shift in his career now-- he's heard wonderful things from his brother about the terrific students Pennsylvania Homeschoolers AP Online attracts! We are also very pleased to again offer a 'lead-up to AP' class in Honors English Language Arts, led by Jody Best once again. This class, which has had a very successful first year in 2018-2019, is organized to follow the key guidelines of the College Board new Pre-AP courses, and will help prepare students in 8th, 9th, or 10th grade to be ready for the rigors of AP-level coursework in a full range of disciplines. Jody Best is not only a certified teacher in English, but the homeschooling mother of two wonderful daughters who have taken part in many of our AP Online classes. Her class is just the right *starting place* for many students. Along the lines of this 'lead up' English course, we are also very pleased to be able to offer now an INTRODUCTION to Computer Science online class, led by our current AP Computer Science Principles teacher Rebekah Lang. This course is designed for 8th, 9th, or 10th graders with a strong interest in this field, but much less background experience and understanding. This course will make AP Computer Science coursework much more accessible in future years for many students. NCAA--YESSS!!! Several years ago, our program completed the process to have our AP courses approved as *core courses* for the NCAA eligibility requirements for student-athletes seeking to play Division I and II sports in college. (The only AP courses we offer not considered as 'core courses' are AP Art History, AP Studio Art, and AP Music Theory-- these don't count as 'core courses' for public schools, either...) We now regularly submit our Pennsylvania Homeschoolers AP Online transcripts for our student-athletes who are registered with the NCAA. Hooray!!! During the 2018-2019 school year we have had approximately 840 students involved in our classes, and many of these students were taking two, three, and even four classes through our program (especially once they are experienced in AP level coursework). We hope that your students will be able to join us next school year! We are proud of the academic community that has developed as homeschooled high school students connect with their bright, motivated classmates from all across our nation and even around the world. and how homeschooled students from anywhere in the world can apply to our classes. Our classes develop a community of scholars who interact through class postings, course-related projects and games, responding to one another's work, discussions, and much more. Check out our new Class Showcase postings by teachers to get a feel for their classes in action. See statistics from the College Board showing that more than three quarters of our students earn top grades of 4 or 5 on the AP exams, and learn how word of mouth has helped our courses grow without a marketing campaign or corporate backing. We now have all of our Pennsylvania Homeschoolers AP Online class information for the 2019-2020 school year updated! Students can begin the *application process* NOW, and *tuition payments* can be made starting on March 1, 2019. Hope you'll find AP coursework suitable for your student!